Whopper with cheese for Valentine's day. Delicious! Ian and I have always enjoyed Valentine’s Day. We take turns planning it – one year Ian plans what we do and the next year I plan it. That way we are surprised every other year and we can enjoy doing something special for each other. Over the years we have eaten in the finest restaurants, stayed in the nicest hotels, traveled to exotic countries and given/received lovely gifts on February 14th. Our celebrations have changed quite a bit in the past 10 years, becoming much simpler (and cheaper!) as our lifestyles have changed, but we still celebrate a day of love for each other and for our children. This year it was quite different with Ian being in a South African hospital for knee surgery and me staying at a nearby hotel on a day that the African country’s corrupt leader was forced to resign. But really, it was possibly the best Valentine’s Day yet. Why? Because Ian was in pain, and the surgery would take him out of pain (who doesn’t want that for their spouse). Because the hotel I stayed in had crisp white sheets, big fluffy pillows air conditioning and I got to eat a Burger King Whopper and French fries from McDonalds!! (We don’t have either fast food chain in Swaziland, and I love burgers). As I sat and ate my Whopper with cheese, alone, I thought of my friends Terry McGill, Linda Howard and Sandy Wise, all who have recently lost their life partners, and who didn’t get to celebrate Valentine’s Day with their loved one this year. 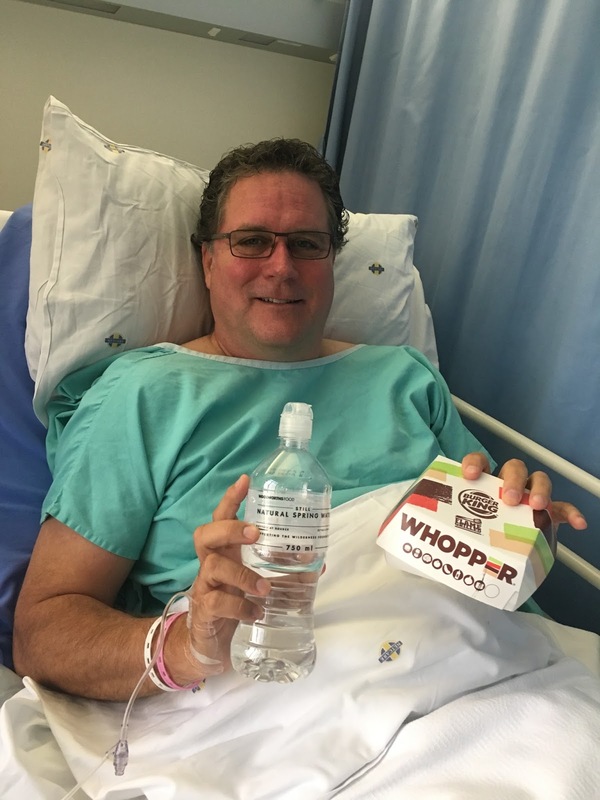 What would they give to be eating a burger in a hotel in Africa while their partner was having knee surgery in an African hospital? Just about anything, I would imagine. This knowledge made me even more thankful for our situation, while feeling heartache for my friends. 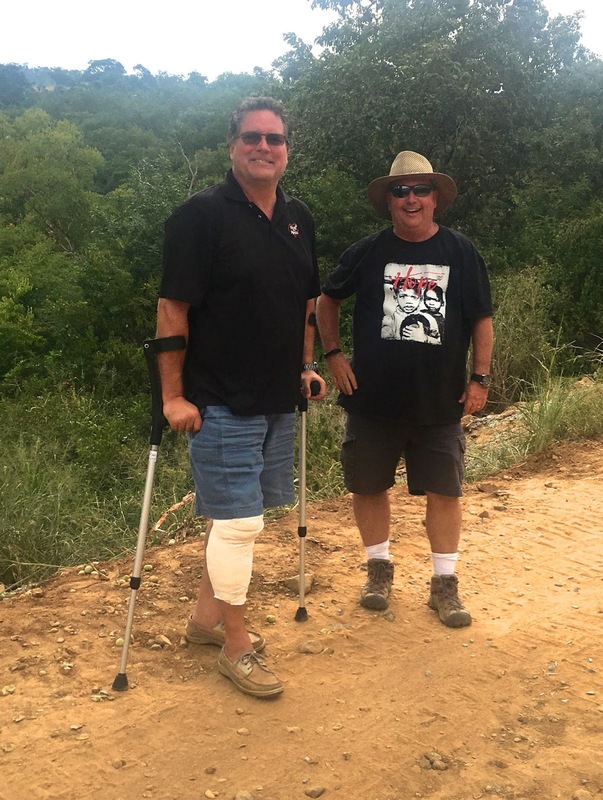 Ian with Pete Wilkerson as we arrived back on Project Canaan. We have been married for 26 years, have lived in three countries and have 2+178 children. We have laughed more than we have cried. We have played more than we have fought. We have lived complicated lives and simple lives (and we sure love the simple life better). I will say that the Lord could not have given me a better life partner and we compliment each other in so many ways. He is my rudder through smooth waters and through the storms. His faith in God is unshakeable and that faith keeps many people who know him focused on Jesus, not themselves or their circumstances. Happy Valentine’s Day Ian. I love doing life with you. Live from Swaziland … I am thankful. PS - This is day #3 since surgery and Ian is walking without crutches and is in NO pain (no pain killers). We give thanks for total healing! Also, check out our brand new US website at www.heartforafrica.org! 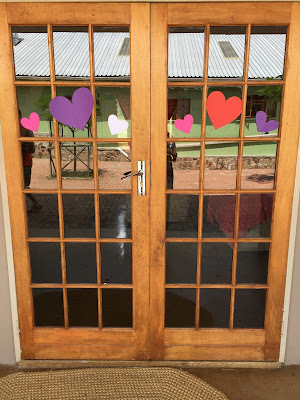 If you are reading this blog before 9:00AM EST, be sure to go to the Heart for Africa Facebook page at 9:00 AM EST sharp where you will be able to join our LIVE VIDEO feed of the Project Canaan Valentine’s Day party with the Emseni kids (age 3-7). If you missed it, go to https://www.facebook.com/heartforafrica/ and scroll down to the video. We typically have Kids Club at 9:00AM Swazi time on Saturday mornings, and each week the children rotate in small groups every 15 minutes through five stations. There is a theme each month and each station supports that theme including; a craft, dance party, physical fitness activity, bible story and bible memory verse. Today we moved Kids Club to the afternoon so that our friends and family from abroad (aka YOU) can join us! Our theme today is “Jesus loves EVERYONE” and we believe that with all our hearts. Each February we focus on building monthly support for our children, and we call people who give monthly our “Heart for Africa ANGELS”. It is through our Angel support that we provide everything that each child needs from food to clothing, from vaccinations to medical staff, from 24 hour care to 24-hour love. We simply can’t provide all that we do without our monthly donors. I know that some people are critical of how we do things? Do the children REALLY need three meals and two snacks every day?? Do they REALLY need their own birthday cake? Do they REALLY need such a low child-to-caregiver ratio (1:5 NOT including our full time cooks, cleaners, drivers and nightshift)? 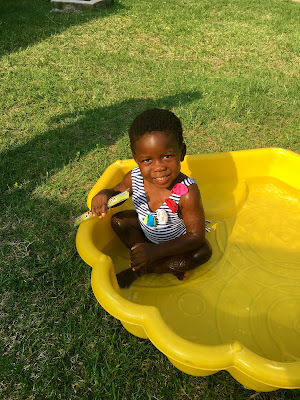 Do the children REALLY need a pop up swimming pool? My answer is yes. They most certainly do. Happy 4th birthday TODAY Gabriella! We love you. These children have been put into our care and we are the legal guardians. Why shouldn’t they eat well (most arrive severely malnourished), be well cared for (most have been abandoned or abused), have their birth celebrated every year (so they know they are valued) and have a way to COOL DOWN in the Africa heat (no, there is no air conditioning). For those of you who know Ian and I well, we want to do things with excellent, not half-baked. And as we continue to serve the Lord in Swaziland, through these children, shouldn’t we do the best that we can do? Our theme for Feburary 2018 campaign is “Love 2 Life”. Our monthly supporters LITERALLY help us to love each and every child back to life. 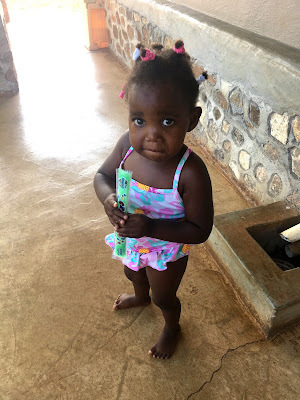 If you read this blog regularly, or if this is your first time, please consider giving any size gift monthly to help us be able to continue caring for these children. In Canada you can become an ANGEL by clicking here. In the US you can become an ANGEL by clicking here. Thank you for helping us loving 179 children back to life. Live from Swaziland … Happy Valentine’s Day! Yesterday was a scorcher with a high temperature of 50C or 122F. It was too hot to even get the air conditioning in my truck to get cold. Our buildings are not air conditioned so when I went down attend Samantha’s 3rd birthday party, I wasn’t surprised to see all of our toddlers in shorts, no shirts, dripped with sweat. I happened to have a box of 48 Icy Pops in the freezer for a rainy day (I mean hot day) so I took those down to the party. Each 2-year-old received their frozen treat by extending two hands, giving a little courtesy and saying some form of “thank you”. I LOVE how our staff teachers our children good manners and Swazi customs. Princess with an ice pop in the pool. After getting their treat they all headed into the sprinkler and/or kiddie pools to try to cool down. It’s hard to explain heat and humidity that we experience here. Everyone moves slowly, intentionally, and you only do what you have to do. And remember, I grew up in Northern Ontario, where we had snow from October – May. I thought this pre-menopausal mama was just simply going to go up in a puff of smoke. At the end of the day an incredible storm hit with a lightening show that brought Ian and I out on to the patio to watch (like watching fireworks, complete with “ooh’s” and “ahhh”s), and the dogs hid under anything they could find. Then the hail started, plants knocked over and we had to move inside because the rain was horizontal. And last, but not least, the power went out at around 6PM. The power is still out as I write this, and we are thankful for our generator that has kept our lights on and our refrigerators cold. February is Valentine’s Day month and we have a treat for you! Next Saturday, February 10th at 9:00AM EST (that is 4:00 PM Swazi time) we are inviting you to celebrate Valentines day with the children at Project Canaan through a live streaming party. If you read my blog of last week you will know that we now have unlimited high speed internet, which will allow us to do this (http://janinemaxwell.blogspot.com/2018/01/when-little-things-become-big-things.html). I will be streaming live from the HEART FOR AFRICA Facebook page and then I will repost the video on my personal page when the party is finished. Did you know that in February 2017 more than $18.2 billion USD was spent on flowers, candy and cards for Valentine’s Day loved ones according to the National Retail Federation? Would you consider reducing your Valentine’s Day spending on friends and family and becoming a monthly donor to support our 179 children? Maybe you would consider a one-time gift? Your gift helps us love our children back to life. To give in theUS click here. To give in Canada click here. I hope you will join our Valentine’s Day party next Saturday, February 10th at 9:00AM EST – Janine Willis Maxwell Facebook. Live from Swaziland … we are always grateful for rain.